I wanted to document a recent collaboration project I worked on with Year 6 pupils at Henleaze Junior School. I was asked by the school to work with the whole year group (around 90 pupils) to create a large art piece to be displayed in the school. For me this was quite a challenge in terms of the scale of the collaboration - simply the size of the group. I had previously worked with HJS on their school 'Shaun the Sheep' project - it was good to be invited back! 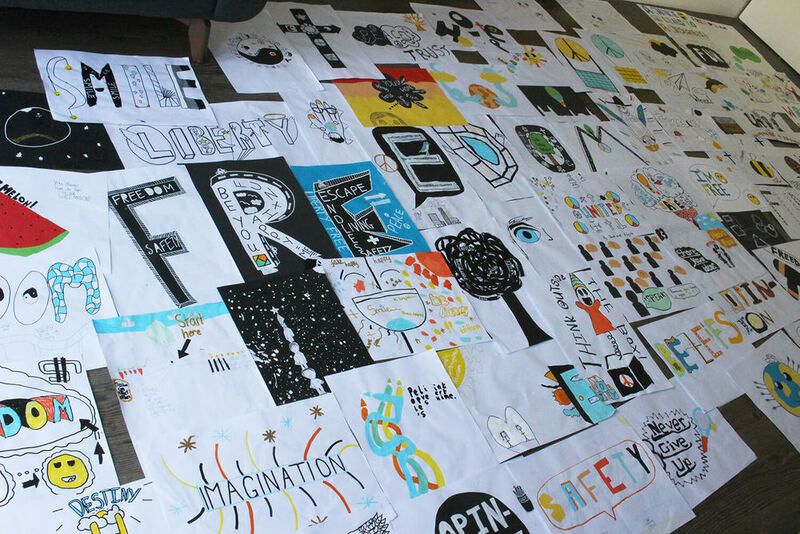 Back in May this year, the school ran a series of art projects (one with each year group) as part of an enrichment programme of events called 'Think Big'. 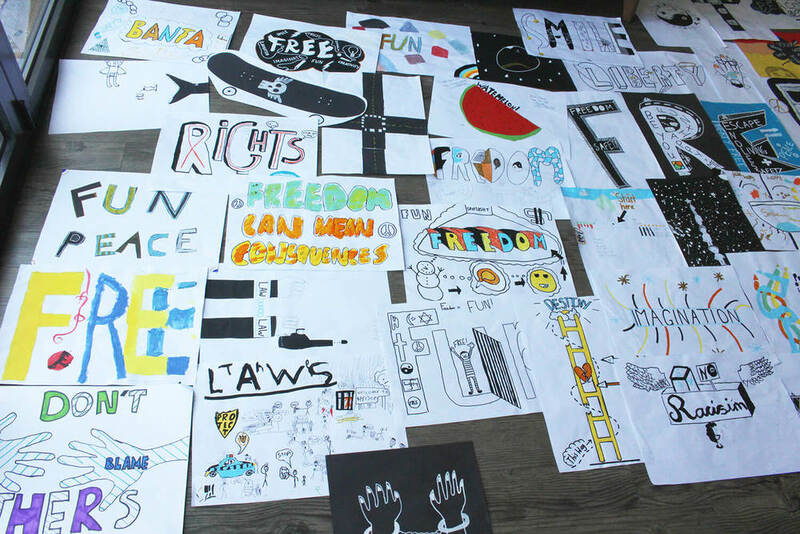 The art projects were themed around 'Global Values' of Freedom, Fairness, Feeling listened to and Friendship, which relate to the British Values as outlined in the current curriculum. The idea was that each year group would work together with an artist to create a piece of art relating to one of the themes. All the artwork would then be displayed in the school hall, and is to last a number of years. As you may have gathered, Freedom was the theme assigned to me and Year 6. The brief, in terms of what we would do was basically open to me to decide, but the final piece needed to fit a space on the wall size 8ft x 4ft. The biggest challenge for me was to work with the 3 classes in the year, around 90 children in total, particularly as I was keen for as many of them as possible to contribute to the final artwork. Playing to my strengths and interests and thinking what the kids might enjoy, I decided we would take an approach which involved hand-crafted type with some illustrative 'doodle' elements. 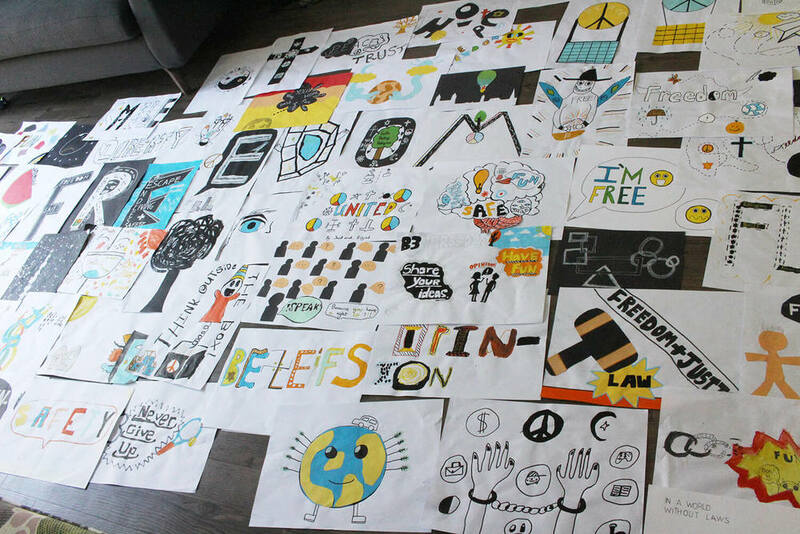 Each child could create their own A3 sized pieces relating to the theme and these would later be pieced together digitally by me, to form a 'mind-map' of thoughts about freedom and it's boundaries. I had one school day to work with the children, which in reality equated to just an hour working with each class, in addition to time at the start of the day for a group presentation/discussion. 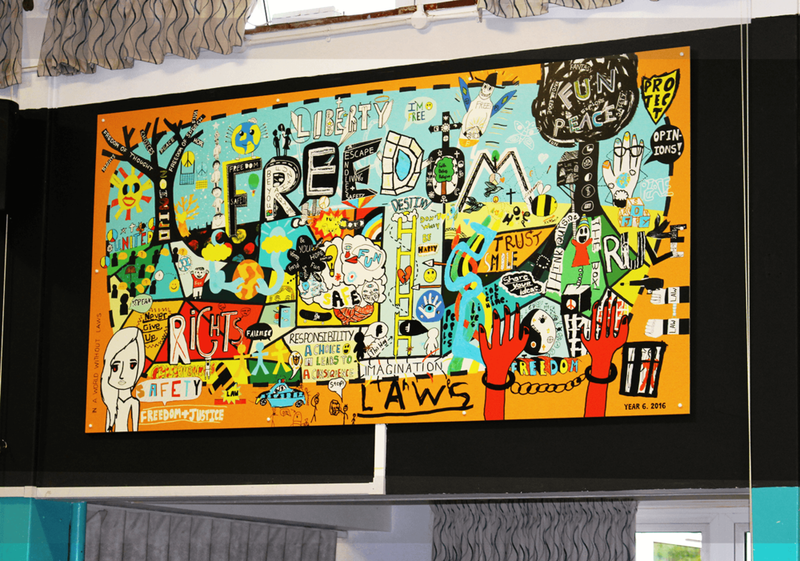 I showed some examples of the illustrative style I had in mind and we had a brief discussion around the themes of freedom, responsibility and law - as this is quite a tricky concept to visualise the children had started to think about this with their teachers prior to my day with them. These are some of the images I showed for style inspiration, from a couple of illustrators I really like: Nate Williams and David Shillinglaw. The work of these guys seemed to be quite fitting for the project, aside from being styles that I like, their work pulls together lots of elements into one overall piece. My aim was that we would create something in a style which was bold, fun, expressive, playful, graphic & colourful. I set a loose colour palette - variations on orange, blue, yellow ( and colours that would come from overlapping these colours) with black and white. The thinking behind this was to help all the children's different work sit together nicely in the final piece. I supplied POSCA pens for the kids to use and coloured paper. With an eye on encouraging them to create bold elements I wanted them to think about making solid shapes by cutting them from the coloured paper rather than necessarily colouring in with pen. Pictured below are some of the individual pieces the children created. I had all these scanned to digital files so that I could work on them in Photoshop on my computer. Below is a super-quick Gif animation of some screenshots I took whilst putting the final image together, to roughly show the process. Related Post | School Art Project: Shaun the Sheep ! 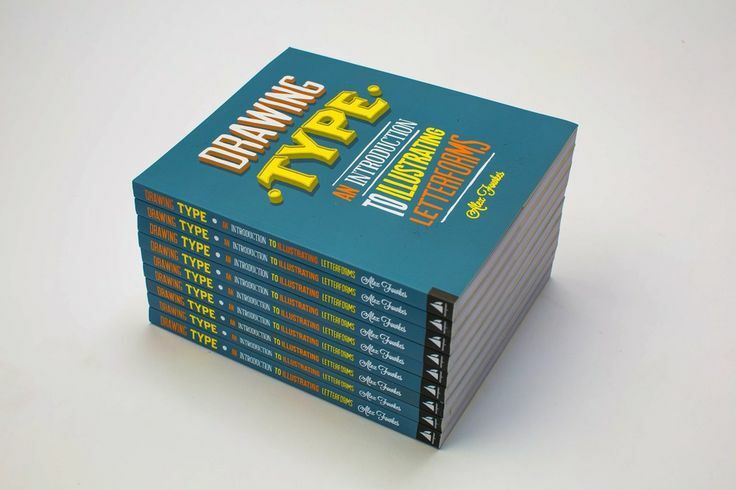 Can this make all the difference for a creative team of one?